One of the most famous themes on Traditional Regencies is the Christmas story. Whole books and plenty of short stories were written about couples falling in love during the holiday season. In fact reading Christmas anthologies around this time became almost a tradition for many readers and we got to know some of the regency traditions through these books. Among the Regency traditions mentioned in those stories we can name the Yule log, Kissing Boughs, the Wassail Bowl, The Christmas Pudding and special drinks like the famous Wassail. Most the traditions are what remains of Pagan rites or Middle Age traditions and people gathered at home, with the family to spend the Holiday Season. We decided to try and gather some of information on the Regency Christmas Traditions and post them here. There doesn’t seem to be that much about it probably because only during the Victorian period did people start to record all aspects of society. Besides the political instability and the fact that England was involved in a war for a number of these years also probably wasn’t conductive to many joyous celebrations and the making of new traditions. Considering all that it may be that Christmas wasn't exactly as portrayed in the numerous books and short stories released around this season, it may be that it was a quieter holiday and there were not as many houseparties as one might think. But there were still some traditions being observed and worth mentioning. The Twelve Days of Christmas would be the period between Dec 24th and Jan 6th. The night of the 6Th was called Twelfth Night and according to some sources there are more traditions related to Twelfth Night than Christmas. Christmas was a memory of the Winter solstice festivals of pagan times and transformed by Church into a celebration of the Christian values. People observed a religious holiday that was celebrated with a dinner with the family or including neighbours and friends. Throughout the Twelve Days of Christmas there might be balls and other merry events to mark the season. Gift giving wasn’t what it is today but servants could expect their gifts on Boxing Day (Dec 26th). Besides Roast Beef, Venison and varied birds (although not turkey) accompanied with vegetables the Christmas Pie and The Christmas Pudding were a big part of the feast. Dozens of pies were baked during this season using sometimes the leftovers of Christmas Dinner and to be eaten during the Twelve Days and given to friends and neighbours for good luck. 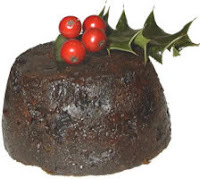 The Christmas pudding is maybe the most famous of the desserts eaten at Christmas and it was made with 13 ingredients (Christ and the Apostles) boiled in a pudding Cloth. Greenery seems to have been the main part of decorating a house for Christmas. Not the Christmas tree that we know today by garlands of Ivy and Holly and mistletoe boughs (the kissing boughs) would be hung around the house and log brought inside – the Yule Log – to burn through the twelve Days. All the greenery would be taken down and burnt after Jan 6th. The holiday season was a time when young boys came home from school to spend time with their families. Naturally some games were organised like charades, snapdragon (picking currant from a bowl of flaming brandy) and playacting to keep everyone entertained. Christmas carols as we know them today did not exist during the regency period; the music of the season was comprised mostly of church hymns like Joy to the World and Harck the Herald Angels Sing. Going wassailing door to door seems to have been abandoned by then. What is a Traditional Regency? This blog is about Traditional Regencies! What is a Traditional Regency? Usually it's a shorter book, compared to other historicals and are set during the first decades of the 19th century in England. There's a special care about historical accuracy and the most important thing is the social rules of the period. They can be light or full of angst but the behaviour code of polite society has to be observed at all times or the characters will suffer the consequences. We are five ladies who love to read and share their thoughts. This blog is about Traditional Regencies, their authors and also some curious facts of the Regency period.